This week I'm really into lace collars, and have been experimenting with making my own (the above is by Emily Temple Cute). I've also been looking at some over-the-top embellished vintage coats, trying to decide what to do for a spring jacket. I bought a fairly simple one at a good price from H&M, and now I just need to gussy it up a bit. I'm also back to my deer rings! I had stopped for a while, but I'm obsessed again (Photo from Vogue?). Floral hair pieces. The bigger the better. I love the rings in the bottom corner photo-so understatedly, elegantly wacky! And the hair is so pretty-big hair makes me look like a ninny, but that photo makes me want to run out and buy a bumpit. 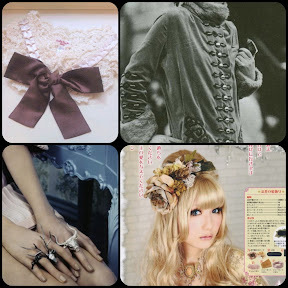 Lace collars are the best accessory ever, I have several from my grandma and they're so pretty and delicate... Lately I bought a zillion of cardigans and I plan to make detachable lace collars for them. I'm really looking forward to seeing yours.